A colleague asked me where my next concert was being held, and I told her it was at Birmingham’s Symphony Hall. Wow, she said, that’s amazing, have you sung there before? I sing there all the time, I replied somewhat dismissively, it’s nothing new. 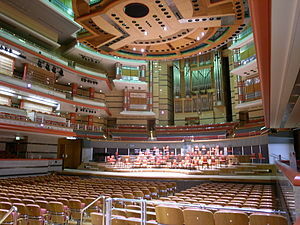 And indeed it isn’t new, as a member of the CBSO Chorus, and previously as a student at the University of Birmingham, I have sung at Symphony Hall on many occasions. But that’s no reason to take it for granted. It’s a fabulous venue, and although I may sometimes forget, when I sing in other places I am constantly reminded just how good it is. We don’t ask for much, we singers. Enough space to breathe, a sightline to the conductor, the ability to hear what we’re doing and something relatively comfortable to sit on. You’d be surprised how often we’re missing one or more of these. My personal bête noire is those risers. You know, the ones with the gaps. As someone with vertigo, I have come to regard them as some sort of choral torture device. I have seen pencils, music and even shoes fall down those gaps, so in my mind, it would be easy for a person to follow (no one said vertigo was logical). Feeling wobbly does not make for good singing. In Germany recently, we did a concert where at least a third of the choir couldn’t see the conductor. At all. Which consequently meant that we spent a concert committing the choral singing sin of coming in just after the beat. But really, that was better than coming in before it… The next night, half the choir were watching the conductor on a TV relay (and desperately hoping there was no delay). But to make it just about the technicalities does some places a disservice. The TV relay venue was the Dresden Frauenkirche. And that concert was amazing. Partly because of the history of the building, partly because the acoustic made Britten’s War Requiem sound phenomenal, and partly (for me), because I was sitting just a few feet away from the incredible soloists (I’ve previously mentioned my love of Mark Padmore’s voice). I’ve jumped at the chance (twice so far) to sing at St Paul’s Cathedral just because the space is so amazing. Although you can’t hear a thing that’s going on when you’re in the choir. Singing on the pitch at Wembley for a rugby league final was a huge rush, particularly when the players ran out, even if I wouldn’t count belting out Delilah as a vocal highlight. We have been known to complain when we go to the Royal Albert Hall, as it will be ludicrously hot and the acoustics won’t be right, even with the mushrooms in the ceiling. But singing at the Proms makes it all worth it. So what’s your dream venue? A friend and I were chatting recently and we came up with the Sydney Opera House as somewhere we’d like to perform. Here in the UK, however, I don’t think we can do much better than our Birmingham home.